Double Dice from Novomatic is a beautifully retro, simple slot game. It has three reels, with three positions on each reel, and five paylines. Despite being so simplistic, Double Dice is actually really fun to play. The Dice feature means that you’re always on the lookout for the dice symbols, depicting double sixes on two red dice! This feature gives you free spins with guaranteed wins! The background is bright blue and the logo is bright yellow and red. Even the colour scheme is keeping it simple with these primary colours. Simplicity is evident in the slot symbols as well, which are all plain, unsophisticated pictures. The symbols include stars, bells and fruits – oh, and dice of course! Double Dice can be put in autoplay mode. There is also a built-in gamble feature which is very easy to use and can give you the chance of multiplying your wins. 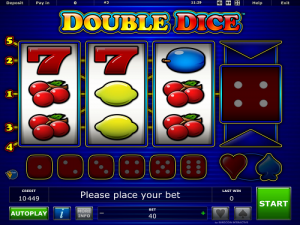 Double Dice also has holding reels to give you second chances for near wins! This Novomatic slot is the perfect choice for any beginner. It’s very similar to these other slots, which are made by the same developer: 5 Line Mystery, Dice Winner, Multi Dice and Golden X Casino. Retro symbols add to the retro fun in Double Dice. There’s nothing more that adds to the slot feel than the old school symbols. They are drawn very simply and it makes this new slot seem decades old. Back in the good old days when slots were fun and you could actually win money! Now it seems like other developers are just making slots that look cool, rather than actually pay you. That’s not the case with Novomatic, though. Double Dice can give you some big wins, especially from the higher-value symbols. These are: the stopwatch, the star, the red seven and the watermelon. The symbols which pay out less are: the grapes, the golden bell, the orange, the plum, the lemon and the cherries. There’s only one payout for each symbol and that’s for three matching symbols. These need to land one on each reel and on a payline. Paylines 1, 2 and 3 run horizontally across the reels. Paylines 4 and 5 run diagonally across the reels. To gamble a win (while playing in normal mode, not autoplay), simply click on the flashing heart or spade symbol. You have a 50% chance of doubling your win, and a 50% chance of losing it – so choose wisely! If you don’t want to gamble your win, choose ‘collect’ and carry on playing. If you happen to spin either two star symbols, two stopwatch symbols or two dice symbols in a single go, the game will give you a second chance! Go for the big three and get a payout with this Holding Reel feature. The game will hold the two reels (that have the matching symbols on them) in place, while spinning the third reel for you for free. This increases your chance of getting a big payout, especially for the star and the stopwatch symbols. When the Holding Reels feature is triggered because of two dice symbols, this gives you a second chance at getting the Dice Feature! For this feature to be triggered, you need at least three dice symbols on the reels. If you land four in one go, the Dice Feature will be triggered twice! When the Dice Feature begins, you get to roll the dice which is to the left of the reels. Whatever number the dice shows, when it stops rolling, will be the number of win spins you get. These are Free Spins which all end in a guaranteed win! You can re-trigger this feature even when you’re using the Free Spins, to get more Free Spins! Check out this game if you’re a beginner or if you’re into vintage-style games. If the Dice is right, the Dice is right!